These notes are aid a smooth and successful day. A certain amount of preparation is essential. Yes, it can be daunting BUT if no-one had a go then racing would not happen. So What To Do for an interesting and well run day ?  Make sure you have an assistant Race Officer or two, AROs – and if you can, encourage a "new member to come and help so that they can see what happens"
 You will need a watch that displays seconds – to time the starts - and it's easier to use one you know (a backup is also advised in case one stops) There will be a stopwatch/ timer available in the club safe or in the RO equipment box.  ROs will need to record the number of laps sailed and the elapsed time from the start for all the boats in both the fast and slow handicap fleets. It is good practice to record the time elapsed for each boat as they finish each lap. Remember races are expected to last around 40 minutes. Arrive at the Club with time to spare, probably no later than 09.45am for Sundays or 6pm for Wednesdays just to give yourself time to plan what to do and get a cup of coffee! Remember that the 1st race needs to start at 11.00am prompt sundays and 7pm Wednesdays. The race series on a Sunday for 2019 will be an AM series of 2 races and a PM series of 2 races. Wednesdays evening consists of 1 race. Decide on the Race Area – if unsure, ask experienced sailors who may be around on the day and they will be more than happy to help – it's for their benefit! If there is an Open Meeting, or other activity, on at the same time, liaise with the person in charge about respective course areas. Open Meetings have priority. 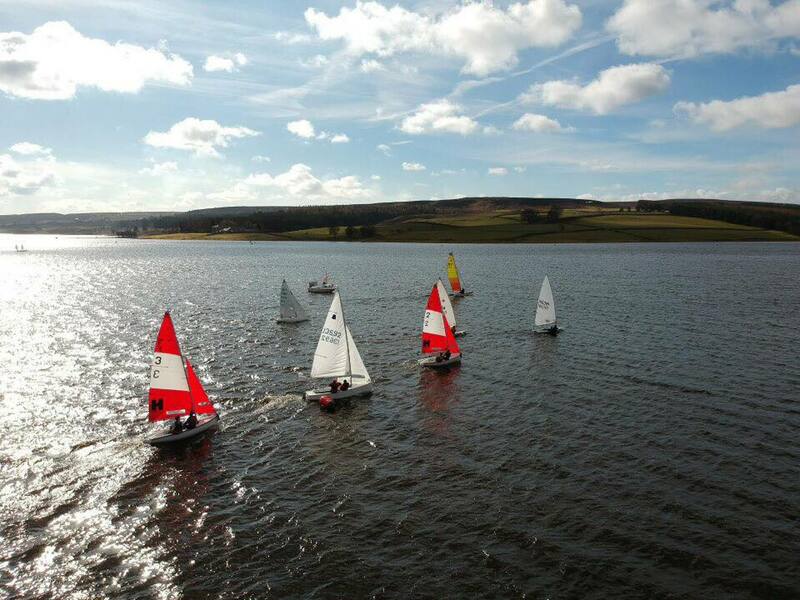 Be aware that if there is a strong westerly wind then windsurfers will likely be reaching across the reservoir from North to South Mark and a dinghy course through that section of the water may add extra hazards.If in doubt confirm your intended course with any windsurfers. Keep well away from the area used by swimmers. ON Sundays Start the races at 11.00am (so aim to have your committee boat in place on the line for 10.45am) – This year the first race is to start on time to ensure that a professionally run racing series is delivered – it is best to advise sailors, via the PA system, of your intended start area and that you WILL start at 11.00 prompt. On Wednesdays the committee boat should be ready on station for you. Place a signing on/retirement sheet on the shelf in the porch, spares in the holder above.  Two boxes of course letters in metal cases.A -- Z + "Gate" + 1 2 3 in case extra marks are used.  Crate containing flags, recording sheets, flag chart etc.  If you have any concerns ask the Safety Team or Sailing Committee members, they'll be pleased to help. It's ALWAYS preferable to have boat starts so that the most can be made of clear wind and true beats. Shorter courses are preferable as they keep the racing boats closer together at the marks, this gives more exciting racing.Aim for a course lap time which is ~15 minutes. 2. A shorter course for the Slow Handicap fleet. Please note that a shorter course is required to ensure that the slower handicap boats are able to get 3 laps if possible. -the start line at 90o to the wind – use a wind indicator or flag on top of the committee boat to check angles. -As a guide the start line length should be (5m x number of boats)+ 50%. For example 20 boats x 5m = 100m + 50m= 150m. The line can be shortened as necessary but only after all fleets have started. Ask the Safety team to bring the end mark in. -avoid setting a hook finish.See definitions of "Finish" inside front cover of Racing Rules of Sailing. -use a gate in the course, i.e. the committee boat and the start buoy/finish buoy, is the most convenient as it means you do not have to move the committee boat. Place the committee boat ~1/3 the distance from the leeward mark to windward. Indicate you are using a "gate finish" by posting the gate card as the finish in the board on the committee boat. The preferred course would be a trapezoidel course. A quick turn-around between races is very important, to ensure sailors do not have to hang around, (finishing slower boats, in any fleet, a lap early also helps this turn around). NOTE. Boats must not go through the gate on a downwind leg. Length of Races - Races should be governed by how long they run for – not the number of laps. -clip on the AP flag in case you need to postpone before the start. 2. Show the courses on the board. 3. Have someone ready, watch in hand, to shout out the countdown to each hoot. 4. There is hooter on each committee boat, a whistle tied to the crate, in case it doesn't work. Note that the the flags have priority in starting not the hooter. 5. Start the race in accordance with the Sailing Instructions, check the sail numbers of boats that have started and add any that you might have missed. 7. PLEASE set a watch going, from zero, at the first fleet start. Record the elapsed times of all the boats as they finish. It will actually be easier and save problems publishing the results if you record the elapsed times of each boat for each lap. If you have a general recall (below) for the slow handicap fleet you will have to record their elapsed times from the start time of this fleet. The results team will use the average lap times adjusted for PN number to produce the final results. 8. Captains will extract the results of boats in their fleets from the published sheet if these are required. If any boat is on the course side of the Start Line (OCS) with one minute to go it should be recalled. Make one sound signal and display Code Flag X. The Race Officer may hail the offender(s) and call out sail numbers but there is no obligation to do so. The onus is on the competitor to respond to the signal and to return behind the start/finish line to start again. Display the X flag until offending competitor returns behind the start line and goes again.Any OCS starter who fails to come back is disqualified (DSQ). If any start is unfair or many boats are OCS and sail numbers cannot be easily recorded a General Recall may be signalled. Once all boats are back behind the start line lower the 1st substitute flag and after a minute restart the sequence. 1)Finish all boats having completed the number of laps you had planned. 2)You can shorten the race (for example if conditions are light and boats will not complete your planned number of laps). To shorten the race hoist the S flag with 2 hoots (shorten course) as boats approach the leeward mark.All boats coming through the finishing line, irrespective of the number of laps sailed, will be deemed to have finished. 3)Slower boats can be finished a lap early if it is clear they will not the target time. They will usually be an obvious break in the fleet at the front of the slowest boats.Shorten the race (as above) as these boats approach the leeward mark.Make sure you record the number of laps sailed by each boat. Remember that all boats coming through the finish line after the S flag has been raised will be deemed to have finished the race. a) Ask Safety Team where to leave the Committee boat. Bring all equipment ashore and replace in garage 2. Please make sure all flags are returned to the correct slot in the box and the course letters in alphabetical order in the correct box. b) Check the retirement sheet, place the results in the plastic container above the shelf in the entrance hall. c) Write down any defects on the Committee Boat, e.g. engine, in a duplicate book which is in a rack in the Office. d) Any problem with flags, letters etc. report to Sailing Sec. e) Any safety aspect must be notified immediately, to any Council member. f) Hand the results sheet to the Sailing secretary (Nicky) or place them in the ducket outside the safety office. Please ensure it is dated and legible and signed by the race officer. Like most things in life, a little preparation will lead to things going much more smoothly.Allocation of the jobs to be done on board will help towards an easier day. E.g. decide who times, who writes, hoots etc.Remember to keep checking that things are going to plan - the correct flags - the correct sound signals etc. Ask for help at any time. We are all still learning and most experienced ROs get it wrong sometimes! Remember; if it all goes wrong – don't worry, it's someone else's turn next week !! !